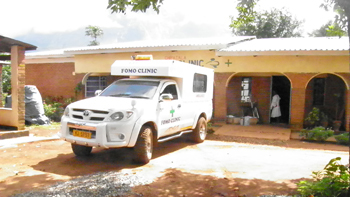 Introduction: FOMO has over a number of years established a rural outreach programme and clinic to meet the desperate needs of communities who have little or no basic health care. The stumbling block is not our infrastructure or our ability, but as we are all aware health care is expensive. FOMO is committed to provide food security, education and a lot more to over 3,500 children and has continued to delevop general medical care programme. Its difficult to outline simply what this programme will mean to the community, but think about all the times you have needed medical care, be it doctor, off the shelf medicine, or specialist help. Now imagine life without these basic needs. Personally I would have been dead at the age of 3! and if you survived what would life be like without the pain killing tablet. Everyone can help with this by donating to the health fund, it will save lives and relieve suffering. FOMO’s Outreach and Day Clinic primary role is to administer health care, support and health education to children registered with FOMO, (Over 3,500) and children. The Clinic also acts as a normal GP service for the community, ie anyone is welcome. Ensure that each of the FOMO centres are capable of meeting the parental responsibility in terms of First Aid and basic health care. Provide access to, and meet the costs of, professional health care via the FOMO clinic and National hospital facilities. Provide access to health care information. Provide training in first aid and basic health care. Provide support for home care patients. Provide accommodation for HIV/Aids children during the drug stabilization period. FOMO in its current form cannot support the total health care requirements, but it can relieve the suffering and hardship of the very poor and give support to the over 5000 orphaned children in FOMO’s care. The basic programme covers three main categories. Outreach Programme and Day Clinic: The primary role of Outreach programme and clinic is to administer health care and education to FOMO registered children and families. The Clinic provides normal GP. minor surgery and testing facilities, but also incorporates day and overnight care facility. The Medical Team provides follow up care, education and counselling to the children and guardians on a long term continuing basis. The Medical Team liaises and works with national and local health care providers (Government, Local hospitals, Social Services, NGO’s and local Clinics) to ensure FOMO’s contribution to the general health care provision is being effectively and efficiently administered. Note: In addition each new purpose built FOMO centre has a first aid room, with sufficient room to hold daily clinics. First Aid Education: The Medical Team ensures that each FOMO centre is capable of meeting the parental responsibility in terms of basic health care, (First Aid +). The Team responsibilities cover delivery of health training to FOMO centre matrons, playschool teachers, and older children. The scope of the training will encompass the identification and treatment of common conditions, (Basic first aid, preventative care and personal hygiene). The centre matron and playschool teachers to be empowered with authority, understanding, knowledge to refer patient with conditions outside the normal scope of basic first aid to the Clinic for further assessment and or treatment. Note: Many of the treatments require a balanced diet, or at least more than one meal a day, provision is to be made to meet these needs for the treatment to be effective. Preventative Care: The Medical Team and centre matrons to pass on the knowledge they have gained to the general population and encourage the children to come to the centres for education and treatment.